There is a new drug that can target and block harmful metal ions in the brains of Alzheimer’s patients. This drug developed by Dr. Chris Orvig from the University of British Columbia, is known as a chelating drug, which means it grabs hold of its target and makes it unable to do more damage. This is a massive breakthrough for treating Alzheimer’s disease, for which there is no cure. This research is very important because you can only treat the symptoms of Alzheimer’s, and the leading treatments do a very poor job and targeting the affected brain cells. Dr. Orvig’s model drug has a sugar molecule to help deliver it to the brain. It is a very innovative idea, and there have been no previous Alzheimer’s drugs that are effective at getting the drug into the brain. 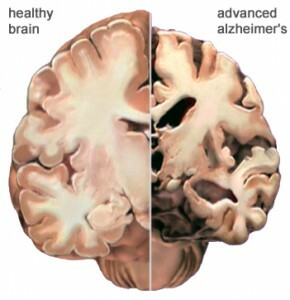 One of the effects of Alzheimer’s is neurodegeneration, which means the brain cells die. As these brain cells die, the patients lose their memory and motor skills, making it hard for them to live on their own. These patients then require family members and or caregivers to help with daily activities like preparing food and bathing. This takes a large emotional and financial toll on the patient’s family. The actual causes of the disease are not known very well, because there may be many factors that contribute to this disease. But it is known that Alzheimer’s is not genetically inherited, although some genes may contribute to the risk of developing Alzheimer’s. For more information about what causes Alzheimer’s disease listen to our podcast! The following video does a great job summarizing Dr. Orvig’s research and what Alzheimer’s disease is all about. There is hope that research like Dr. Orvig’s will eventually lead to a better understanding of this disease and eventually a cure. 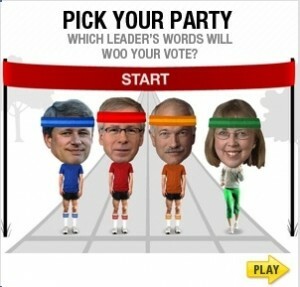 With the Canadian election race in full swing, some people know exactly who they are going to vote for, and others are unsure. Each of us have our own biases and opinions about the big issues like healthcare, defense, and the economy. The team of researchers looked at the different sizes of these two structures called the anterior cingulate cortex and the amygdala (click the name to find out more information about each structure from Wikipedia). This team suspected that there might be a structural difference in the brain that accounts for these differences. And this is indeed what they found. People with larger anterior cingulate cortexes tended to have more liberal views. Whereas people with larger amygdalas tended to have conservative views. But there is not enough evidence to conclude that only these structures account for the political differences. There were too many uncontrollable factors to take into account, such as life experience, family history, also what kind of environment the subject was raised in. And people also have the ability to change their views over time. 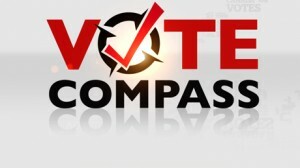 Vote Compass is a free online survey where just click the answers that are closest to your opinions and it will tell you which political party you are closest to. I think it’s pretty cool, to check it out click on Vote Compass to go there now. What do prejudice, monkeys and evolution have in common? Posted on March 18, 2011 | Comments Off on What do prejudice, monkeys and evolution have in common? The vast differences among humans is what makes us unique. Unfortunately these differences have been the cause of many wars and discrimination all over the world. Science Daily covered a new study, in the March issue of the Journal of Personality and Social Psychology, that shows prejudice may have an evolutionary basis. For those who don’t know, prejudice is having a preconceived judgement toward a person or people because they are different. 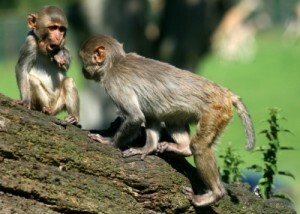 The study conducted at Yale University has found that social groups of Rhesus Macaque (Macaca mulatta) show prejudice to other social groups. The researches showed the subject monkeys pictures of in-group monkey faces, and out-group monkey faces. And, they also would pair those faces with either good things like a banana, or bad things like a predator. The researches then recorded the amount of time the subject monkeys would look at each sequence. So, there was little difference in the looking time when in-group monkeys were paired with good things, and out-group monkeys were paired with bad things. What surprised the researches was that when a picture of a out-group monkey was paired with a good thing, the monkey would look at it longer. This is because like humans, monkeys view in-group monkeys as positive and out-group monkeys as negative. These results imply that the ability to distinguish between “us” and “them” may be at least 25 million years old, when humans and Rhesus monkeys shared a common ancestor. Fortunately, in the relatively recent years of human existence, humans have become more aware of negative prejudice, and have been starting to change their views. Some humans even have a laugh about it. Comments Off on What do prejudice, monkeys and evolution have in common? 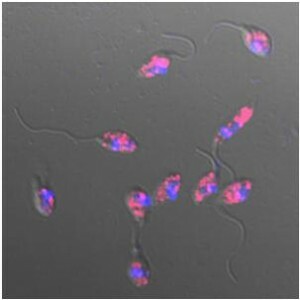 An infection, known as leishmaniasis, is caused by the parasite Leishmani. This disease is mainly spread by sand fly bites. Symptoms of this infection are, large skin lesions, fever, swelling of the spleen and liver, and, in more serious forms of the disease, disfigurement and death. According to the article, this disease affects over 12 million people worldwide. The article can be found here. The virus infects hosts by a Trojan Horse technique. “The strategy of the “Trojan horse” as a mechanism of pathogenicity of intracellular microorganisms is, to avoid the immune system and its memory function cleverly, with phagocytosis of infected and apoptotic neutrophils by macrophages, employing the non-danger surface signals of apoptotic cells.” From Wikipedia. How the virus is increasing the pathogenicity is a fascinating question for researches right now. It may open up new opportunities for finding its cure. This is the first time I have ever heard of this disease. Although this disease seems very serious, and will never deter me from enjoying the sunny beaches of Central and Southern America. Here is an interesting study about infants and how they develop social dominance. Five studies were done with 144 infant participants showing that 10 to 13-month-old use relative size to predict the outcome of a dominance contests. This correlation of social dominance and relative size is found almost universally with human cultures and with the animal kingdom. 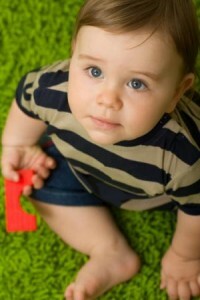 The methods of the study were complicated as infants can’t just tell you what they are thinking. So they basically observed the infants reactions to different visual situations. This study also makes me think of how we chose our mates. Females usually want a man who is bigger than them, and males want a female who is smaller. I know as I grew up that my Dad was definitely the dominant one in the family, larger than my mother, and he set the rules and enforced them.